ATIK – YDG | 17 – 07 – 2012 | There are currently 771 students kept in prisons because they claimed their right to equal, free, scientific education and lessons to be in their mother tongue. They faced disciplinary actions, suspensions, repression, violence and imprisonment due to their opposing stance. This, once again proves that the ruler have no forbearance to any kind of opposing and demand for rights. Those students who fight for their rights are seen as “a head to axe before it grows”. Universities are no longer institutions of science, wisdom and intellectualism where students research, debate and develop their knowledge in social and political matters; they are instead turned into private factories with rote, competitive, non-scientific, unqualified education to create its homogenised human type. The fascist TC State continues all its attacks on those who oppose, stand against and speak up to its brutal doings. The ruling fascist mentality doubles the force of its attacks when revolutionary or Kurdish students are involved. People’s youth, particularly the Kurdish youth are targeted and arrested without any evidence. They arrest these young people for reading legal books and papers, attending press conferences, and as in the example of Cihal Kirmizigul, they get arrested for wearing a “pusi” which is a traditional middle eastern scarf which became a very trendy fashion item all around the world and was worn by all off the large party leaders in Turkey during their visits to the east. NEW YORK, July 25 (Reuters) – New York police officers have used excessive force, made unjustified arrests and engaged in pervasive surveillance in violation of the rights of Occupy Wall Street protesters, according to a report released by two law school clinics Wednesday. The report documents 130 separate incidents of alleged abuse by law enforcement authorities and calls for the creation of an independent inspector general to monitor the New York City Police Department. Some critics of the department’s controversial “stop and frisk” policy, including the New York Civil Liberties Union, have also called for an inspector general. Mayor Michael Bloomberg has said that such a position is unnecessary. “Many of the reported allegations individually indicate clear violations of the government’s obligation to uphold assembly and expression rights,” says the 132-page report, which was produced after eight months of research. Greece is in turmoil. Violent clashes have shaken the city of Agrinio in the west. Supporters of the far-right Golden Dawn party fought with anarchists, leaving cars and shop windows smashed, and one person injured. Golden Dawn’s influence is rising. It gained around 7 per cent of the vote in the recent general election. RT’s Jacob Greaves takes a look at xenophobia in today’s Greece. and an end to 50 years of brutal Military Dictatorship. On July 14, thousands of Palestinian refugees marched in a funeral procession for 11 unarmed protesters shot dead by Syrian security forces in the al-Yarmouk refugee camp. Raucous and seething with rage, mourners chanted for Syria and Palestine, called for the downfall of Bashar Assad’s regime, and sang for freedom.Whether this burgeoning civil disobedience movement will grow into an open, durable rebellion remains to be seen, but the significance and the potential influence of the latest wave of protests that has swept Syria’s largest Palestinian camp cannot be overlooked.As the Syrian uprising gathered momentum and the Syrian regime escalated its repression against what started out as a peaceful revolt, concerns have emerged about the impact of the uprising on Palestinian refugees in Syria, who make up just over 2 percent of Syria’s total population. 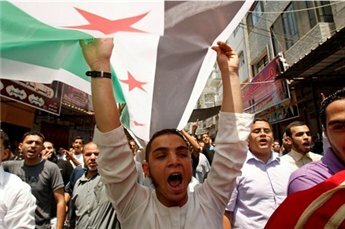 The Palestinian political elite in Syria have been divided. Some factions have desperately attempted to appear neutral, distancing themselves from the unrest. Others, such as Ahmad Jibril’s PFLP-GC, Fatah al-Intifada, and the Palestinian-Baathist militia al-Sa’iqa, have actively supported the regime, bolstering its propaganda campaigns and crushing civil dissent inside the camps. In stark contrast to the moribund, aging political leadership, Palestinian-Syrian youth activists, who prior to the eruption of the uprising had focused their activism on Palestine, have participated in the uprising since the very beginning as demonstrators; organizers of aid and relief work for wounded and internally-displaced Syrians; or as citizen journalists, photographers and media activists. The hub of their activism, however, remained outside the camps for most of the uprising. Never were the tensions among Syria’s Palestinians as discernible as during the aftermath of last year’s Naksa Day protests on June 5, when dozens of unarmed Palestinians were killed by the Israeli occupation army in the occupied Golan Heights border area. Yarmouk inhabitants and martyrs’ families set the PFLP-GC building ablaze in a strong denunciation of the faction’s role in mobilizing to instigate the youths to march back home without any protection despite the anticipated deadly reaction by the Israeli army. The faction engaged in a pathetically naked attempt to deflect attention from the regime’s crackdown. Several Palestinians were killed in the clashes that ensued between Yarmouk residents and armed PFLP-GC gunmen following the funeral. However, with the exception of the Syrian navy’s attack on the al-Raml refugee camp last summer and the occasional Syrian army shelling on refugee camps in Daraa, Hama and Homs, the situation in the refugee camps remained cautiously quiet. Since February, the al-Yarmouk camp has regularly held protests in solidarity with the besieged Syrian cities and towns. It participated in the Damascus general strike on May 29, 2012. The protests would normally pass quietly without being attacked by Syrian security forces. 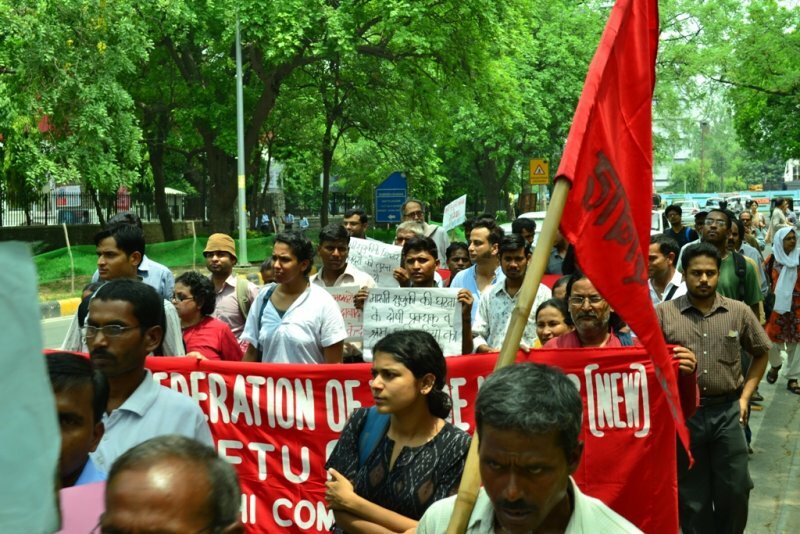 NEW DELHI – A large number of people Saturday protested against the repression of workers at Maruti Suzuki plant, a leading car manufacturer and urged government to act against management of the company and to release innocent workers, who were arrested following violence inside the plant on last Wednesday. Withdraw the ban on aviation strikes! Solidarity with the Turkish Airlines workers! Over the last 6 weeks Turkish Airlines (THY) staff have been fighting against unjust dismissals along with the ban on the right to strike. The attacks on the workers of Turkish Airlines are continuing and becoming ever more fierce as the management rely upon government support to do as it pleases. Negotiations between HAVA-IS (Civil Aviation Union- Turkey) and Turkish Airlines has broken down after several months of meetings regarding Collective Bargaining Agreements (TIS) and has come to a point where a “middleman” is needed to continue the negotiations. In a space of 1 week after the breakdown, the government, after gaining approval from President Abdullah Gul, changed the laws and forbid workers in the aviation sector from taking strike action. In response to the ban on strikes, THY staff stood firmly side by side and took one-day strike action as a warning to the government. The management of THY however, accused the workers of “illegally taking strike action” and shortly after sent mobile text messages to 305 workers notifying them of their dismissal.